The 35th running of the Breeders’ Cup Championships return to Churchill Downs Nov. 2 and 3 – the event’s first time back in Louisville since 2011. It will mark the ninth time the race has been held in the Derby City. The Breeders’ Cup started in Hollywood Park, California, in 1984. What was originally a one-day, seven-race event has grown into a two-day, $30 million experience attracting the best horses, trainers and owners from around the world. It has also become the unofficial end of the thoroughbred-racing season. A handful of University of Louisville students has had front row access throughout all of the planning and promotions for the event. Sixteen students in Karen Freberg’s COMM 510 (PR and crisis) class are working with the Breeders’ Cup team to develop social media strategy and marketing for the event. The students have been working on collaborative communications since before the fall semester even began. The students have studied and analyzed literature related to strategic development, content creation, influencer marketing, public relations and social media management and communication. They have also been able to implement their learnings to develop a public relations and social media strategy promoting the Breeders’ Cup event. Freberg said this is the biggest client she has worked with for a class project. The opportunity to do so came together from her friendship with Joey Wagner, of J Wagner Group. The two have collaborated before on other projects. “He has always been super supportive of the work we are doing at UofL. He was the one who introduced me to the Breeders’ Cup and the idea of collaborating together for this class came about,” Freberg said. 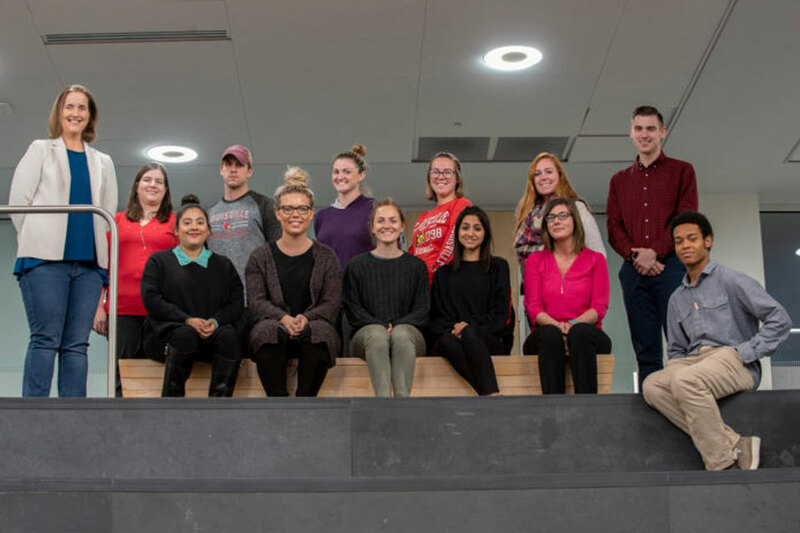 The project actually began in late 2017 and Freberg communicated the opportunity to her students – both graduate and undergrad – once they were enrolled in the class. One of those students is Katie Wells. She is a graduate student who serves as a group leader with Berry Craig IV. Wells said the group has done both primary and secondary research on both the Breeders’ Cup and Breeders’ Cup Festival to see what type of content is likely to create the most engagement. “We noticed in the past, there was little engagement from the Breeders’ Cup accounts and we are hoping to change that this year,” Wells said. The students have access to the Breeders’ Cup social media accounts and have been monitoring their posts closely. They have also created appropriate responses as needed for Facebook and Twitter. “By increasing engagement, we are hoping to allow those following on social to have a great experience, too,” Wells said. In addition to researching, creating content, executing and monitoring, Freberg’s students have also undergone training as part of the class. All students will complete their HubSpot Academy in social media certification by the end of the semester. They also have the option to obtain Hootsuite’s Social Media Marketing certification. For Wells, her favorite part has been developing content and creating measurable objectives for the campaign. Freberg said that enthusiasm has yielded “impressive” results so far. “We are in the final stretch in preparing, which is exciting,” she said. “They have been doing some of the best work I have seen during my time here at UofL. I am very proud of them.